Since 1912, the Port of Vancouver USA has been an economic engine and job creator in Washington state. Located at the hub of the Pacific Northwest on the Columbia Snake River System, this deep water port has five marine terminals and 13 berths that handle more than 400 ocean-going vessels and river barges annually, with a total cargo volume exceeding six million metric tonnes. 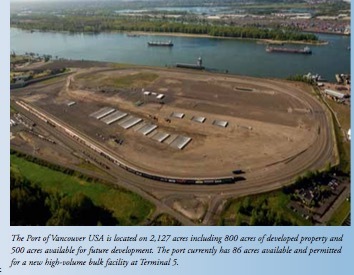 The Port of Vancouver USA now has space available at its newest terminal — Terminal 5 — for a new high-volume mineral bulk facility. Permits are already in place and construction can begin immediately on this 86-acre parcel, which is specially designed to handle a multi-million- tonne facility. This site provides a unique opportunity to develop shovel- ready property on the US West Coast. Terminal 5 features a loop track that allows unit trains to be handled within the port’s internal rail complex. Four 8,500ft. loop tracks were specially designed to accommodate multiple unit trains carrying a variety of dry and liquid bulk cargoes. There is also room to add a fifth track to meet future capacity needs. Two Class 1 railroads — BNSF Railway and Union Pacific Railroad — transit the Port of Vancouver, offering cost-effective rates. The port has nearly completed its West Vancouver Freight Access rail expansion, a $275 million project that will more than triple the port’s rail capacity and reduce regional rail congestion by as much as 40% on BNSF’s main north-south and east-west rail lines. This allows the port’s capacity to grow from 55,000 to 400,000 railcars per year. The port’s location near key freight corridors, including I-5 and I-84, provides quick access to major north-south and east- west routes. Transloading cargo to barges on the Columbia River ensures efficient movement of freight and access to inland ports serving the Midcontinent. The port offers the most efficient, direct, uninterrupted route between the Pacific Rim and the US Midcontinent and Canada. Customers save almost half the time — and thousands of dollars — compared with shipping through Gulf ports. Efficient trade routes to and from the US Midcontinent and Pacific Rim have never been more critical as shippers seek to cut costs and save time when importing and exporting goods. That’s why many of them are partnering with the Port of Vancouver USA. Located only 106 river miles inland from the Pacific Ocean, the port is situated on a 43ft (13.1m) deep draught shipping channel with berths capable of handling Panamax-sized vessels. It specializes in handling break bulk, RoRo, bulk and project cargoes, with dedicated facilities for handling wind energy components, automobiles, grains, pulp, mineral ores, and agricultural commodities, among others. Long term agreements with shippers, OEMs and stevedores ensure shipments can be scheduled at an agreed-upon rate so cargo efficiently and reliably reaches its destination. The port has a dedicated staff that works closely with customers to ensure efficiency in all areas, whether in leasing buildings or property or consulting on shipping and supply chain logistics. This team of talented and experienced people offers outstanding customer service and a strategic and consultative approach that capitalizes on the port’s unique capabilities.